You may have a friend or colleague who has previously visited a podiatrist for biomechanical assessment and has suggested you consider it. Or you may have spoken to your GP or a physiotherapist who has suggested that a musculoskeletal assessment by a podiatrist may help you recover from or even prevent your injuries. So what are these terms: podiatric biomechanical assessment and podiatric musculoskeletal assessment? Those two different terms really mean the same thing. We apply mechanical principles to the human body in movement. The assessment allows the podiatrist to understand how and why the mechanical function of the leg and foot can lead to symptoms. Focusing on mechanical function we are looking at the forces that we are subject to in every step of our day to day activities or in our sport and leisure. We can’t see those forces so we look for evidence and clues during the assessment. Pains in the lower back, hip, thigh, knee, ankle and foot may all be down to the way we walk or run as we try to compensate for a slight difference in position or alignment of the foot, ankle or leg which has caused an increase in the forces. external (for example through the surface we walk or run on, or through poor or inappropriate footwear. If you attend for a podiatric biomechanical assessment you should allow up to an hour for the assessment and bring a pair of shorts (or leggings) and also a selection of footwear, – especially the shoes that you spend a lot of time in, including any sports related footwear. The older the shoes the better, as the wear patterns may give the podiatrist some extra clues! Static assessment: here we look at your whole body posture in static stance, and of course focus on foot and ankle posture. We also examine the lower limb when you are lying down, looking at joint movements and muscle strength. 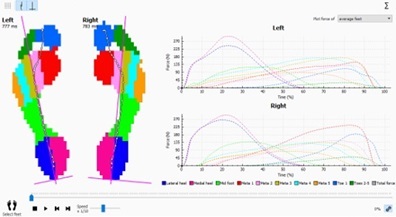 Dynamic assessment: the podiatrist looks at your movement when walking or running, often termed gait analysis. 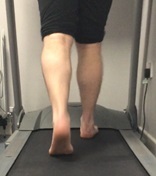 To provide more information and evidence the podiatrist may utilise technologies such as treadmills, video analysis and computerised pressure plate analysis. A foot orthosis (plural orthoses) is an insole which has been manufactured and customised for an individual, to alter the forces the body is subject to, by changing the alignment or impact of the foot during gait. This change in the foot position can help to reduce stresses in the tissues of the foot and leg, and improve efficiency and function. 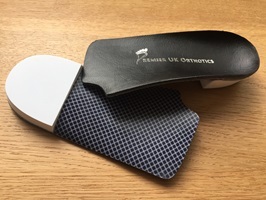 Customised orthoses (some people use the term ‘orthotics’) can be d esigned utilising foot pressure data, 3d scans of the foot, and can be 3D printed in manufacture. They can be tailored for specific activity, or can be for everyday use. Often, they can be altered and amended following a period of evaluation to ensure optimum performance.